This 4,600 sq. ft. home is located on Lake Guntersville in Guntersville, Alabama. 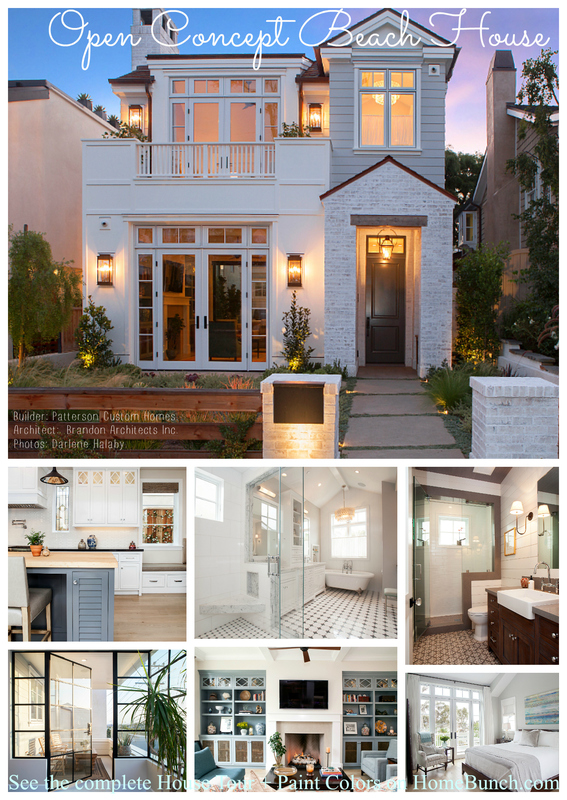 It was designed by the architect, James F. Carter and interior designer Mark Kennamer of Mark Kennamer Designs. All of the cabinetry featured in this home was custom designed and built by Cantley and Company. 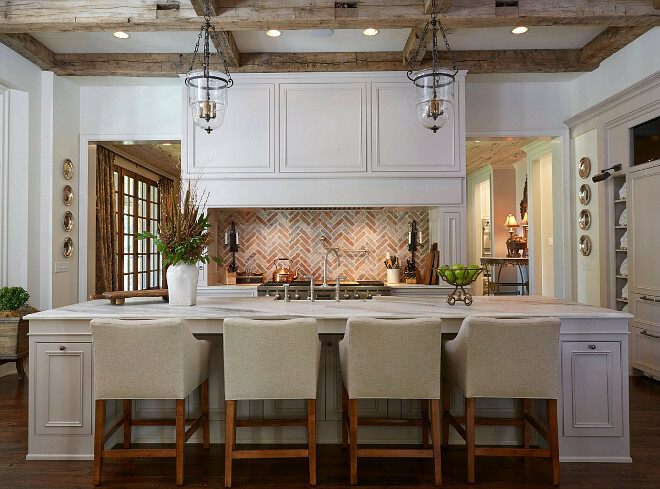 This Cyndy Cantley-designed traditional kitchen features Montclair Danby marble countertops, custom cabinets, and a backsplash of brick pavers in a herringbone pattern. The powder room features a demi lune vanity, and the custom cabinetry in the owner’s office features space for files and supplies. 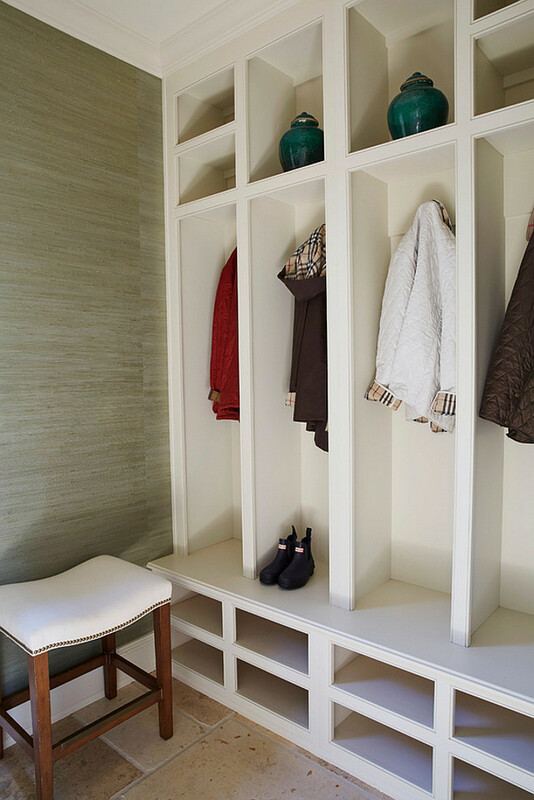 The designer also designed custom storage lockers and a gift wrapping station in the neutral mudroom. 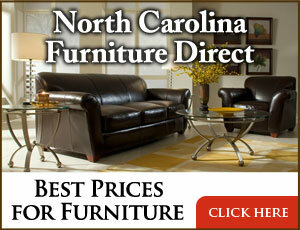 I am sure you will be impressed by the design and quality of the custom cabinetry this home features. I sure am! This kitchen is truly gorgeous, isn’t it? The cabinet paint color is Farrow and Ball Elephant’s Breath. 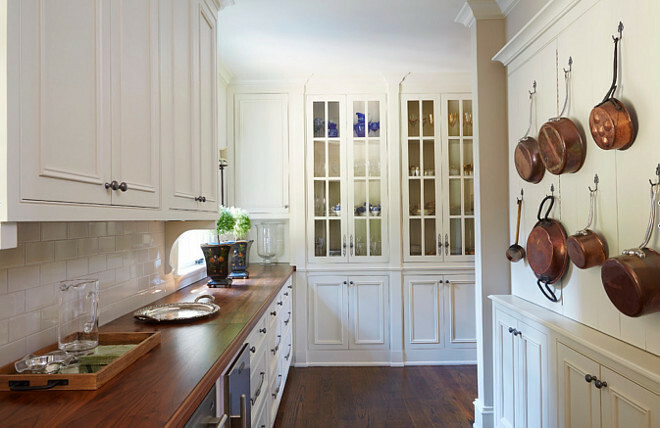 Cabinetry was designed and made by Cantley and Company. Stools are by Mark Kennamer Design. 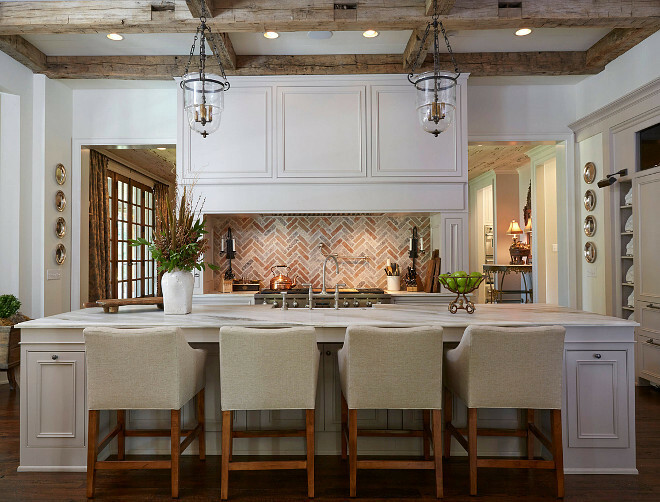 To add a rustic, yet timeless feel to this kitchen, the designer added reclaimed wood beams on ceiling and brick paver as backsplash. What a fabulous combination! The kitchen island and perimeter counters are Montclair Danby Marble. Appliances – Subzero and Wolf. 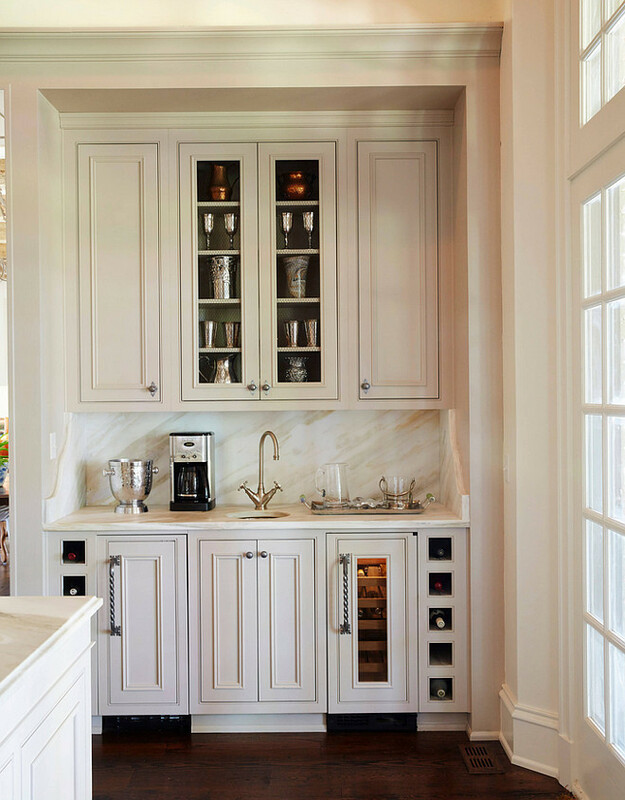 By the kitchen island you find a practical and fully-equipped beverage cabinet with its own prep sink and wine fridge. Flooring: Antique French White Oak Hardwood Flooring. This butler’s pantry is spacious and very useful. The cabinet paint color is Farrow & Ball Elephant’s Breath. The butler’s pantry features a small farmhouse sink, Black Walnut plank countertop and Waterworks subway tile backsplash. I’m loving this serene and neutral mudroom. Flooring is Limestone. 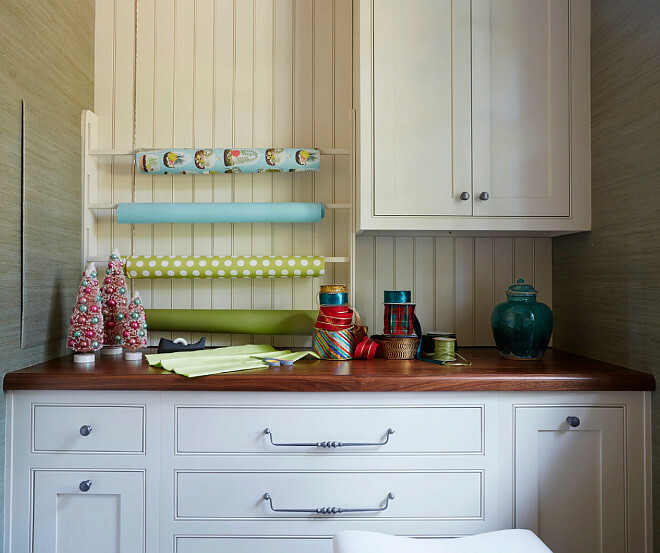 This mudroom also features a custom cabinet with gift wrapping station and Black Walnut wood countertop. 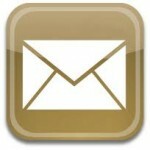 Cabinet Hardware: Available through Cantley and Company. 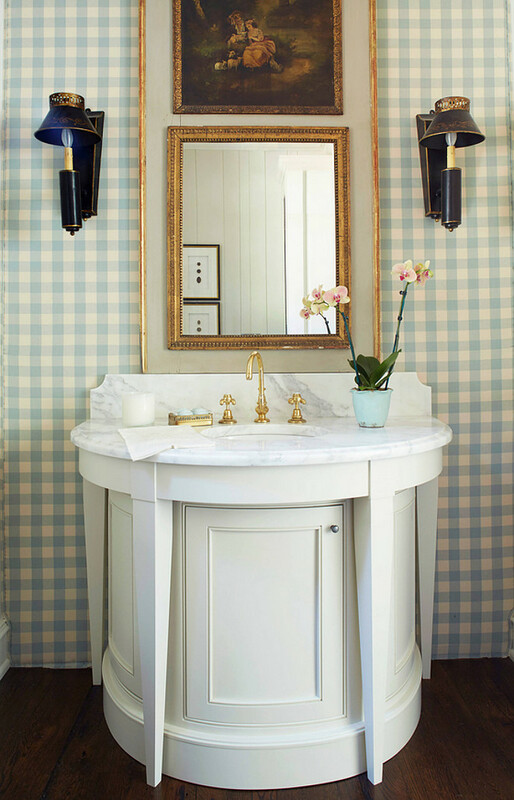 This charming powder room features blue and cream gingham wallpaper and a custom Demilune vanity designed by Cantley and Company. Vanity paint color is Farrow & Ball Elephant’s Breath. 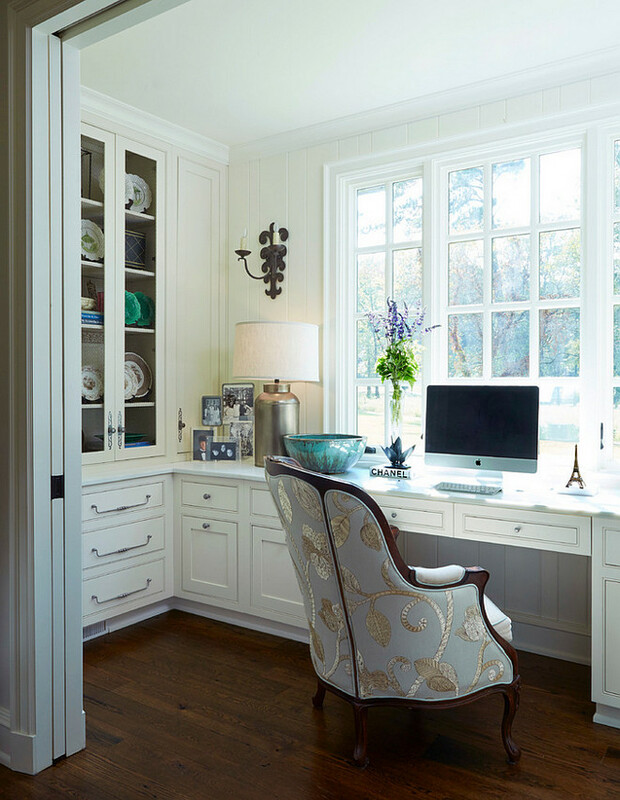 I love the amount of natural light this traditional home office receives, not to mention the stunning cabinets! The desk countertop is Montclair Danby marble. Floors are once again Antique French White Oak Hardwood. 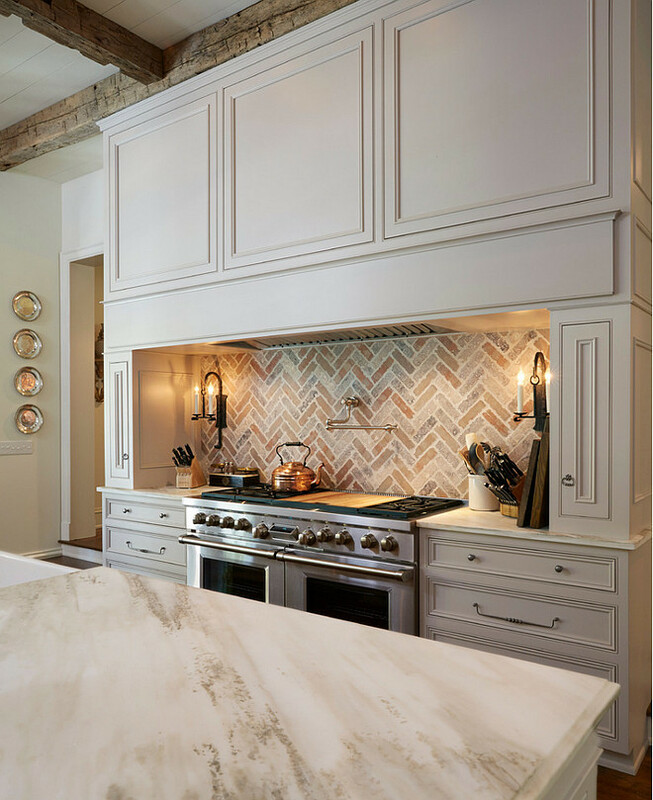 Cantley and Company is based out of Birmingham, Alabama and has been in business for over 20 years and they’re well-known for making bespoke custom cabinetry. Aren’t these cabinets breathtaking? 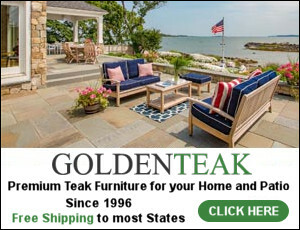 I thought you guys would love to see them and know more about this company. 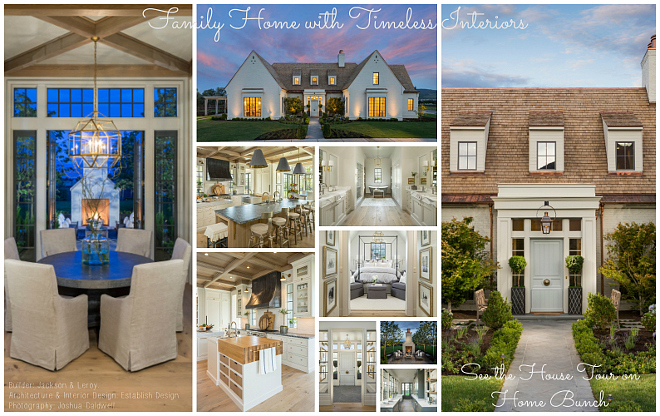 Monday: Family Home with Timeless Interiors. Tuesday: Open Concept Beach House. 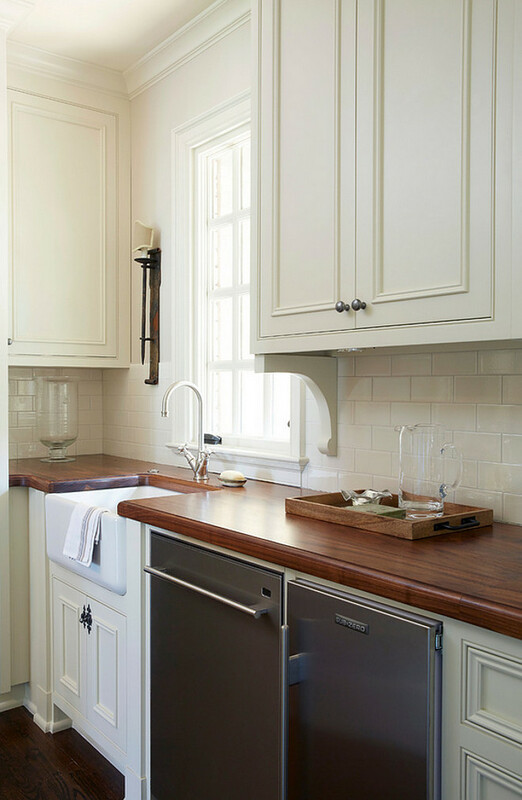 Seeing this gorgeous kitchen really makes me want to transform mine… I love this creamy white color. It’s so soothing and it looks amazing with the marble countertop and the hardwood floors. Dreamy! Talking about kitchens, I am planing on cooking more often. We’re very busy with summer activities for the kids and I need to come up with some good ideas for dinner. We eat out way too often, which is something we love, but it can become very pricey, especially when you’re a family of five. So, I’ve decided to cook more for my family… it’s not only cheaper, but also much healthier! Do you guys have any recommendation for dinners that I can freeze? I want to cook ahead so it’s easier with our busy schedule. Thank you, my friends! Have a healthy and safe day! We’ll talk soon! 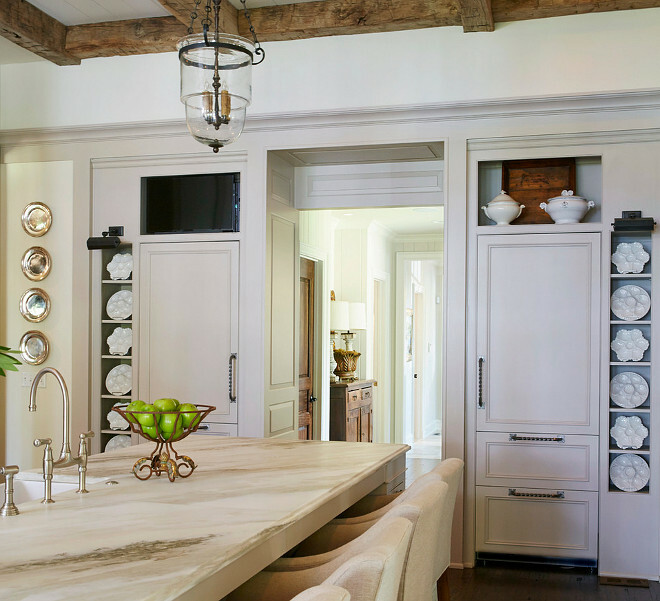 That kitchen and all the cabinetry is simply breathtaking! Although the use of color is subtle, it is wonderful to see rooms with warmth and personality! Now that question is a Skype question….we don’t freeze a lot of food, but we love home made lasagna, chicken curry, home made pesto. You are wise to make this change. Along with the added cost, comes the added sodium and other salts/preservatives that are hidden in restaurant food. Should have said Skype discussion.